Connecticut College, New London, Connecticut, February 21–24, 1994. Revised 2017. TThe Second Symphony is a pivotal creation in Bruckner’s work. In it, the concept of the symphony that he would use for the rest of his life first came into being. That concept included the two-part structure of the allegro movements with a three-theme exposition and reprise, and the five-part rondo with coda that he used for all of his subsequent symphonic adagios but one. He also continued to develop the use of orchestral texture as a thematic element, which he had already employed in the D minor symphony composed in 1869, now called “die Nullte”. The Second initiated a monumental tetralogy of symphonies, concluding with the Fifth, created without break during the period 1871-1876. This tetralogy can be appreciated fully as such only if the early versions of the symphonies are considered, since only they are truly contemporaneous with the continuous development of the composer’s style. The early versions of the Third and Fourth have been published by the International Bruckner Society under Leopold Nowak’s editorship, and are being performed and recorded with increasing frequency. The availability of these early versions is bringing about a major reassessment of the quality and scope of Bruckner’s accomplishments – and the reassessment is entirely to the composer’s credit. They have a structural integrity and monumentality of form and texture that the more familiar later versions, despite their wide appreciation, simply do not match. The early version of the symphony itself has three variants: the first comprising each movement as first conceived in 1872, and the others being the somewhat altered texts performed in 1873 and 1876.5 All include extended passages of bold and inventive music which have not been heard since the time of their composition. Precise dating of the changes is made possible by the existence of the composition score, three copy scores, and a nearly complete set of performing parts which were only used in performance under Bruckner’s own direction. The handwriting styles of the copyists who prepared and altered these sources are sufficiently distinguishable to make a detailed study possible; consequently, matters concerning the copyists bulk large in any analysis of the development of the symphony. Mus. Hs. 6060. Pages removed from 6035 in the course of revision. Mus. Hs. 6059. Pages removed from 6034 in the course of revision. Haas’s source L Contains pages removed from Mus. Hs. 6035, some of which had been inserts themselves. There are many annotations by Bruckner. Source “X” At least thirty more pages removed from Mus. Hs. 6035, neither seen nor suspected by Haas. Source “Z”. The composition score, presumed destroyed in 1895 when Bruckner moved to the Kustodenstôckl. First movement. Begun 11 October 1871, [completed] 8 July 1872 in Vienna. Trio. Sketched 16 July 1872 P.M., completed 18 July 1872 A.M.
Adagio. Begun 18 July 1872, sketched 19 July 1872, 9:30 A.M. in Vienna, completed 25 July 1872 in Vienna. Finale. Sketches 28 July 1872 in Vienna, sketches 4 August 1872 in Vienna, begun on 10 August 1872 in Linz, completed on 11 September 1872 at St. Florian. Thus the symphony was created within a very short period, almost entirely during the summer of 1872. There are no surviving preliminary sketches, except for a very short fragment written on the back of the 1869 short-score sketch for a symphony in B flat which the composer abandoned (Wn Mus. Hs. 6018). The Second Symphony sketch is dated 1870. In fact, there is evidence in Bruckner’s working score, Mus. Hs. 19474, that it itself is here and there a filled-out orchestral sketch.6 The first three movements, in the order First movement-Scherzo-Adagio, were thus completed in Vienna, and the Finale was sketched there as well. Then, sometime between August 4 and August 10, Bruckner went to Upper Austria, taking the manuscript with him, and there completed the Finale. The manuscript as we now know it was completed by a different copyist, Carda (apparently pronounced “Tscharda”), who placed his signature at the end of the score, “Linz 1872 Carda”. The great bulk of this copy score, begun by Tenschert and completed by Carda, is also in the Austrian National Library, where it is catalogued as Mus. Hs. 6035. But some of its pages became separated from it during revision, and are now in another bundle in the Austrian National Library, Mus. Hs. 6060; still more are at Kremsmünster Abbey in Upper Austria. Yet thirty-five more separated leaves were in private possession in 1938. Haas examined these leaves carefully and described them rather fully in the critical report to his edition, but he did not keep a record of where they were, and their present location is unknown. Furthermore, there were at least thirty more pages that had already disappeared by Haas’s time. Perhaps Haas did not suspect the loss because he had not systematically reconstructed the original state of the first copy score in his 1938 study of the symphony. Carda was also the chief copyist for the parts, and it seems that their preparation was the next phase of the project. Carda almost certainly stayed in Linz as long as Bruckner was there, and four other copyists helped him with the string parts. This was in preparation for a planned rehearsal of the symphony by the Vienna Philharmonic under Otto Dessoff. The rehearsal did not lead to a performance, however, owing to the hostility of Dessoff, who thought the work “nonsense” (“Unsinn”) and impossible to perform, as well as opposition from a sufficient number of players.8 As the rehearsal progressed, however, many of the players became enthusiastic and applauded, among them the cellist David Popper. Other people were also present, including Franz Liszt, who was completely charmed (“ganz entzückt”) by the symphony. But Dessoff remained entrenched in his opposition. Nevertheless, a year later, on October 26, 1873, a performance by that orchestra did occur, under Bruckner’s direction rather than Dessoff’s, and it is pleasant to report that the whole orchestra had by that time become quite enthusiastic about the symphony. Even the reviews were by and large favorable, particularly mentioning Bruckner as a good conductor.9 Carda seems on manuscript evidence to have been working closely with Bruckner, entering various changes into the parts to make them ready for the performance. A second performance was arranged for February 20, 1876, and on that occasion another copyist entered some additional changes. Finally, starting later in 1876 or in 1877, both copy scores and the parts were extensively revised by two more copyists in preparation for a third performance to be under the direction of Johann Herbeck. But that performance did not take place, and the manuscript parts were never again used. Before going on, it is interesting to note that several of the wind parts are labeled “Symphony no. 3 in C minor”. This shows that at least for a while Bruckner contemplated admitting the “Nullte” Symphony to the numbered canon as his second.10 But the string parts, which seem to have been made a little later than the wind parts, bear no number at all, and in several of the cases where “no. 3” was indicated, a correction to “no. 2” was made in pencil, possibly as late as the premiere in October 1873. Perhaps Bruckner felt that the new symphony was so much larger and grander in scope than its predecessor, that it would be better to regard the D minor symphony as a sort of second Study Symphony, and not give it a regular number. This phase of the work on the Second Symphony continued with the completion of the parts. Carda finished all the wind parts, and some of the string parts, but for the other string parts assistant copyists were employed. They took up their work at measure 150 of the Adagio, appending their personal flourishes at the ends of the movements; one helper, Cervenka, also signed his work. Carda’s own signature appears, under his graceful and distinctive flourish, only at the ends of three of the parts, but the same flourish without his name occurs very frequently throughout the parts that he copied. Finally, Carda made another complete copy score, most of which now comprises Wn Mus. Hs. 6034, with separated pages preserved in Wn Mus. Hs. 6059 and at Stift Kremsmünster (Kr Regenterei 56,8). This copy is written on different paper with smaller staves, and Carda’s handwriting looks a little different, which may account for the fact that Haas did not realize that Carda copied the finale in both manuscripts. The final page, now separated from the main manuscript and preserved in Mus. Hs. 6059, bears merely the inscription “Linz 1872”; but the identification of the copyist as Carda, considering the other signed score and the parts, can be considered absolute. Yet a third copy score, now in the City and Provincial Library of Vienna as Wst M.H. 6781, derives from Mus. Hs. 6035 in its final revision. It was probably copied in 1877, certainly by 1884, and bears a dedication page to Franz Liszt. the comprehensive reworking of 1877. The analysis on which these identifications is based comes from correlation of colors of pencils and inks, identification of musical handwriting, degrees of consistency in the entering of alterations, and accidental features, such as physical indentation of datable inserts by the revision copyist’s pencil while he was making other nearby changes. Three alterations made at about the time of completion of the symphony can be clearly identified. One of these concerns several places in the first movement, where the woodwinds play in a distinctive five-note dotted rhythm, which, by virtue of its recurrence in the finale, may be considered the motto rhythm of the symphony. The music at four of these places was altered by Bruckner at an early stage, the alteration being to increase the pitch variation. In the original version of a typical measure, the pitch of all five notes is the same, while in its revision the pitch of the short notes might be a third or more below the pitch of the longer notes. These measures can be seen in their earlier form in Wn Mus. Hs. 19474. They were also entered into the first copy score, Mus. Hs. 6035, and the parts, in this same way. However, they were then revised in both 6035 and the parts by painstakingly scratching off the notes affected by the revision and neatly inking in new pitches. But in the other copy score, Mus. Hs. 6034, one finds only the revised form of these passages. This alone clearly proves that 6035 is the earlier of the two copy scores, contrary to Haas’s statement in his critical report. Furthermore, the fact that 6034, the later score, is still dated 1872, shows that the change was an early one. It is curious that these laborious alterations are almost entirely inaudible in performance, serving only to thicken the texture slightly (Ex. 1). The other two changes are of far greater importance. One of them, the reversal in order of the movements, has been discussed above. The other relates to the Adagio. Bruckner originally conceived this movement as a four-part ABAB form with coda. However, toward the end of the compositional process, Bruckner seems to have decided that an elaborate fifth part would enhance the movement. The new form, ABABA with coda, thus became similar to that of the Adagio of Beethoven’s Ninth Symphony, which seems to have been the model for this symphony in other ways as well. The later insertion of the fifth part can be explicitly seen in 19474, although it is not clear exactly when in 1872 it was brought in, but the extension of the movement had to have been done by some time in September, when the movements were reordered in the orchestral parts and copying was resumed. Now a feature of this fifth part, which Bruckner was also to employ in every subsequent use of the form, was delicate, improvisatory, filigree-like passagework for the first violins. At first, this music, along with a short similar passage for the violas, was in groups of six or nine equal sixteenth-notes (Ex. 2), producing a purling, “watery” sound, reminiscent of the prologue to Wagner’s Das Rheingold. Soon afterward, though, Bruckner altered the groups of six notes to groups of five, and the groups of nine to irregular groups of eight and seven. This was done very artificially in 19474 simply by the arbitrary scratching out of one or two notes in each group; there was no true rewriting of the figuration as there was later to be in 1877. This change was carried out before that section of the Adagio was copied into the parts, because, although the early music in the first violin was detached and discarded in the revision of 1877, the area of the viola part containing the figuration remains and that figuration is in quintuplets, with no sign of having once been sextuplets. It is probable (but not certain) that the text which Bruckner brought to Otto Dessoff and the Vienna Philharmonic at the rehearsal in October 1872 was the Tenschert-Carda copy score and the parts prepared by Carda and his helpers, incorporating all of the above-described revisions. At that time, two major adjustments were made to the Adagio. The first was apparently caused by the solo horn player’s unstable upper register. In those days, the Vienna horn with its beautiful, warm sound but notorious unreliability, had already been in use for many years. Bruckner had originally concluded the Adagio with a lovely but treacherous horn solo; however, the parts (and 19474) show this solo struck out and the music transferred to the first clarinet and the viola section. Nobody who has ever heard this symphony can doubt that the change was made for practicality only, but the removal of the horn solo became permanent at this very early stage of the symphony’s existence. This means that in every subsequent performance and recording wherein the horn has been used, it has, strictly speaking, been out of context. The change was entered into the parts by Carda, with the extra notes for the violas written on small pieces of music paper painstakingly inserted as hinged flaps. The other Adagio change has long been thought to have been made at the instigation of Johann Herbeck, then the director of the Court Opera. He had been instrumental in convincing Bruckner to move to Vienna, and Bruckner had therefore placed considerable trust in his judgement. It seems to have been at this rehearsal, or shortly thereafter, that Herbeck suggested a violin solo for the fifth section of the Adagio. This solo, together with alterations to the bassoons, the upper pair of horns, and the alto and tenor trombones, was inked and penciled directly into Bruckner’s composition score, Mus. Hs. 19474, by Carda, who also prepared a special page for the solo violinist, now separated from the other parts and kept in Vienna (Wn Mus. Hs. 6061). The violin solo is in duple quarters and duple eighths; although it is mainly confined to outlining the melody, together with the rhythmic complexities already caused by the shift from sextuplets to quintuplets in the first violins it must have created an amazingly detailed sound – not to say an impenetrable musical fog. At this time Carda also put the changes into the bassoon, horn, and trombone parts. These new texts were used in making the second copy score, now distributed among 6034, 6059, and Kremsmünster. Ex. 2 shows the beginning of the fifth part of the Adagio in short score, in the readings of 1872, 1873, and 1877. New trombone rhythms at two of the motto passages in the first movement (mm. 129-135 and 446-452) have also long been associated with Herbeck; they are entered directly into 19474 in pencil. This happened after 6034 was copied, for the change is explicitly visible there as well as in 19474 and 6035. Thus the change could be either from late 1872 or from 1873. In the new version, the trombones play in the motto rhythm instead of using the former half notes. The trombone passages were also extended slightly; and the kettledrum was introduced at m. 450 (H-N 438), probably to correct an oversight. A change of the first and second horn from sounding G to C in m. 367 (H-N 355) of the first movement, entered into 19474 in rose-madder ink and showing as a change in 6035 and 6034, is also from 1872 or 1873. The new first horn note is the same note that seems to have given problems in the Adagio, but here it is loud (ff) and therefore much easier to play. It was almost certainly for the 1873 performance that the repeats of the Scherzo and Trio were cancelled. The repeats were scribbled out in the parts in a wide variety of methods, suggesting that the individual players were instructed to do it from the podium. The dating is ascertainable from the method of cancellation in one of the bass parts: the player used blue pencil for his notations, including the cancellation of the repeats, and another of his blue-pencil notations, the reinforcement of a rest, occurs at m. 516 (H-N 504) in the first movement, in the first crescendo of the coda which was removed in 1876. So it may be concluded that the repeats were cancelled at an earlier time, which must be 1873. The date of 1873 for these changes, all entered by Carda, is consistent with the fact that Carda also made the two copy scores of the first version of the Third Symphony, one now at Bayreuth and one at Vienna (Wn Mus. Hs. 6033). These copies could not have been made until the end of 1873, when the Third Symphony was finished. Although 6033 bears no signature, location, or date, it suggests that Carda was living in Vienna by then. Perhaps he had always lived there and only happened to be in Linz in the late summer and early fall of 1872 in order to be with Bruckner. Yet another change to the Second Symphony’s Finale at this time (1873) is the removal of the second crescendo in the coda, mm. 761-784 (Nowak 656-679). The effect of this cut is to have the C major peroration at 785 (Nowak 680) burst in on the quiet quotation of earlier themes, without preparation, just as is done in the first movement. At the same time Bruckner seems to have been disturbed by the apparent weakness of the bass line in the finale peroration, and added a fourth (!) trombone to double the contrabass part. It was written into the conductor’s score in octave transposition rather roughly, the first page of the peroration now being preserved in 6060, the rest in the lost bundle described by Haas. It was also written into the other copy score, neatly, by Carda, with “8va bassa” showing its proper sounding pitch; this music is now in 6059. This trombone part descends to C (the organist’s “great C”), and is the only instance of Bruckner calling for such an extreme register. He seems to have had the organ in mind when composing this passage, almost as if he were seated at the console, playing joyful chords in the motto rhythm on the manuals, with the melody as a pedal solo. (Something like this is done by Bach in his Toccata in C Major, S. 564, which Bruckner played himself at the première of the Second Symphony!14) Adding the fourth trombone reminds one of an organist’s reinforcement of pedal diapasons with a thirty-two-foot contra-bombarde, although it is not nearly as effective as that would be; only a tuba could produce enough sound to make the bass line really solid, and of course the tuba did not enter Bruckner’s music until the composition of the stately chords of the introduction of the Fifth. These are much less complicated than the alterations for 1873, but they affect the sound of the symphony at highly critical points. First: the coda of the first movement was shortened by omitting the first crescendo. The cut, which like all of the revisions of 1876 was indicated in the parts by a copyist using green pencil, created an awkwardness in the first violin line which was somewhat ameliorated in 1877.15 The inner movements were not altered for the performance of 1876, the violin solo in the Adagio was kept, and the internal Scherzo repeats remained cancelled. However, in the finale, some important changes were made. In the development, the fantasy on the second theme following the “Neuer Satz” was made more concise. In 1872, the contrast between the treatment of the wild and disruptive first theme and the noble, soaring, other-worldly second theme could hardly have been stronger. In both cases the themes show much more of their inner character here in the development than at any other place in the movement. However, the use of the “Neuer Satz” in 1873 threw the proportions off, and in 1876 the second theme material was cut and parity between the two sections was restored.16 The coda was abbreviated too, perhaps so that it would have a length similar to that of the first movement; although the second crescendo which had been removed in 1873 was restored, a much larger shortening was made by cutting the first crescendo and the quotations of earlier themes following it. Lastly, in the peroration Bruckner recognized the impossibility of getting a strong sound in the bass with the Finale’s orchestra at the Finale’s tempo, and rewrote the strings in unison, cancelling the impractical fourth trombone. Another change, considerably more mysterious, must also have been carried out in 1876. This was a further rescoring and thickening of the melodic fragments in the fifth part of the Adagio. These changes seem to have been an afterthought since they were not entered into the parts. Perhaps Bruckner wanted to hear the tunes more clearly and quickly carried out appropriate revisions shortly after the performance, but by the time of the reworking of 1877, decided to go much further. Unfortunately the pages with these alterations are in source L and the editor has had to rely solely on Haas’s description and printing of the passage in his Vorlagenbericht; if source L ever becomes available again, further evidence of the significance of this music (and the rest of the music included in it) may emerge. The sequence of changes, revealed so clearly by the parts, should also be visible in the two early copy scores, 6035 and 6034. It almost certainly is, although the manner is not always easy to see. For example, the passage in the Finale from mm. 305 to 402 in the original score was disturbed several times, leaving in the scores an almost impenetrable tangle of stub ends, incomplete and shifted pages, glued surfaces sometimes concealing stub ends, strengthening strips of various widths and colors, and relocated sewing. In the first alteration to this music, done in 1873, mm. 305-360 were cut and the Neuer Satz added. Then in 1876 mm. 383-402 were cut, and a new tempo designation placed at m. 381. Eventually, in 1877, still different music was substituted for the Neuer Satz, and slightly but perceptibly later, the passage from m. 374 to m. 382 was rewritten, shortening it by two measures and changing the harmonies. Although the introduction of this new music and the reworking of mm. 374-382 occurred at different times, they were probably both done in 1877, quite likely only a few days apart, because both of the 1877 revision copyists were on hand both times. These changes, so easy to see in part after part, are obscured in the copy scores by a constant reshuffling of inserts and discarding and subsequent loss of important pages. A number of clarifications and additions were made in tempo indications. Some of these were entered into the parts by Carda in 1872 or 1873, as shown by occasional crowding in his writing; one of these was the change from Allegro to Moderato in the tempo of the first movement. Others seem to have been added by the players on instruction from the podium, as they are in a wide variety of hands. One of the interesting features of these indications is the complete absence of any indication to play the second theme more slowly in the exposition and reprise, even in the printing of 1892. (However, such a relationship is essential for the later symphonies, and is made metronomically specific by Löwe in his 1888 edition of the Fourth.) Not until the first movement codetta, with its lovely woodwind solos, is there an indication to take a slower tempo. Just as remarkable is the indication Etwas langsamer at measure 300 (H-N 290) of the first movement and measure 403 (H-N 328) of the Finale. In each case the music is a treatment of the second theme (Gesangsthema). Now these are examples of a structural element which occurs in most of Bruckner’s outer movements near the end of the development (Durchführung), and always with an earnest solemnity. Although in the Second Symphony a slower tempo at this point has never been indicated in previous editions, which were based solely on the scores, for structural reasons it seems necessary; so it is gratifying to see the above-mentioned indication systematically entered into the parts in Carda’s writing. Professor Kurt Eichhorn, who conducted the Bruckner Orchestra of Linz in the première performance and recording of the new edition in 1991 17, was very interested in these features and felt that observing them added significantly to the performance. Other tempo clarifications can be detected by the listener in comparing Prof. Eichhorn’s recording with ones already available. For example, it turns out from indications in the parts that all the music beginning at m. 601 (H-N 521), including the pre-coda climax, the second citation of the Kyrie of the Mass in F Minor, and the eerie pizzicato march, must be played at a slower and more flexible tempo, the basic tempo of the movement not being re-established until the beginning of the coda, at bar 695 (H-N 590). This tempo structure would stand in all versions, even in the 1877 version, where the passage following bar 601 is completely rewritten and the citation of the Kyrie is removed. Its role in establishing the shape of the movement for the listener cannot be over-emphasized. 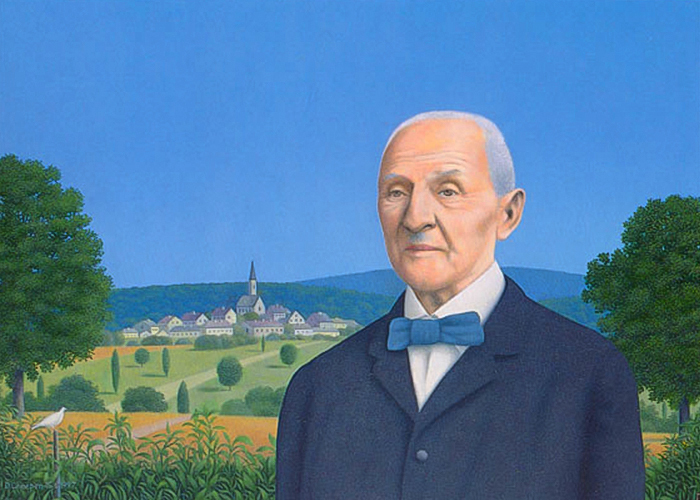 One of Bruckner’s major concerns throughout his work was the appropriate manipulations of large blocks of music. Sometimes it was possible for him to appeal to guiding principles, as could be done in expositions and reprises, while in developments and codas, he was much more on his own, almost as Liszt was in composing his tone poems. Occasionally we can get an idea of what went through Bruckner’s head by looking at his method of revision. For example, when he took out the first crescendo in the first movement coda in 1876, he also removed the corresponding first crescendo in the last movement coda to balance it. Many listeners have in the past been grateful to Haas for including both crescendos in the codas, because they produce a thrilling effect. However, as can now be seen, performing them in conjunction with music from 1877 is anachronistic and ultimately unethical, as the 1877 version has its own logic which stems from the composer, not from an editor. In his symphonies Bruckner seems to want the listener to experience the coda of the Finale in contrast or complement to that of the first movement, and these changes maintain the symmetry of the two codas, and a global logic for the symphony, despite the shortening. A very curious feature of the 1877 version is that all four movements were slightly lengthened near their conclusions. In the first movement, Haas-Nowak m. 567 was added; except for the fff tympani, this is a rest measure.18 In the slow movement, the clarinet ending was extended by the repetition of certain measures.19 In the Scherzo, the upward scale at the end of the coda continues one octave higher through the interpolation of a measure. And in the Finale, an irregular three-measure phrase which creates a sense of excitement is made regular by the addition of Nowak m. 688. An 1877 change which was made in only a few of the parts, sometimes in lead pencil and sometimes in ink, but which certainly belongs to the final conception of the symphony, is the alteration in tempo of the slow movement from Adagio to Andante. The interesting suggestion has been made20 that with the slow movement now in second position rather than third, Bruckner took advantage of the major conceptual difference between the two tempos to reduce the contrast with the flanking movements. If so, this change would be a refinement of a previously-made modification – the sort of thing we know Bruckner to have been doing at this time elsewhere. Another area where major changes were made is the development of the Finale, which like the coda traditionally has a structure at the discretion of the composer. Here the development comprises: lead-in section, mm. 237-278; fantasy on the first theme, mm. 279-360; fantasy on the second theme, mm. 361-422; and transition to the reprise, mm. 423-462. The four sections have respectively 42, 82, 62, and 40 measures, and comprise a symmetrical structure enclosing the contrasting fantasy-treatments of the first and second themes. In the course of time both of these fantasy sections were shortened, the first theme in 1873 and later in 1877 by the use of shorter music (respectively the “Neuer Satz” and the 1877 material discussed above) and the second theme in 1876 and further in 1877. When the dust cleared and all revisions had been completed, the measure counts were (as given in the Nowak score): introduction, 232-263; first theme, 264-307; second theme, 308-347, retransition, 348-387, with respectively 32, 48, 40, and 40 measures. The retransition is uncuttable, but the other sections were reduced proportionately, by factors of 76%, 59% (66% in 1873), and 65%. This makes the fantasy sections less important, and perhaps they do not tell their story as eloquently in 1877 as they did in 1872, but the essential parity between them necessary for an effective antinomy is well maintained. One further revision must be discussed here: that of the huge and polymict third theme group in the reprise of the Finale. In 1872 this vast element stretched from m. 573 through m. 694, with subsections consisting of mm. 573-600 (outburst), 601-641 (crescendo, climax, and silence), 642-666 (codetta, quoting the Kyrie of the F Minor Mass), and 667-694 (pizzicato march). Three of the four subsections remained in 1877: the first, mm. 493-520 in the Nowak score and essentially unchanged; the second, drastically condensed, Nowak’s mm. 521-539; the third section or codetta being removed; and the almost unchanged last section, Nowak’s mm. 563-589, having only a rest measure cut at the end. Perhaps Bruckner felt that the shortening of the development and the coda meant that this heavily-developed material should be cut also. (It is true that in Bruckner’s later symphonies codettas tend to be omitted in recapitulations, and indeed the 1880 finale of the Fourth has hardly any recapitulatory third theme group at all.) But what is important for us to realize here is that although Haas decided completely on his own to keep the 1872 codetta in his mixed version, he also wished to use the 1877 version of the music preceding it, which had been meant to lead directly into the pizzicato march, and not into the by-then-excised Kyrie citation. Thus in order to achieve musical continuity between the two incompatible passages, Haas himself ventured to compose the first violin part in his measures 541 and 543! (These correspond to measures 643 and 645 in the 1872 score.) While this music sounds logical, and might even be what Bruckner would have done if he had made the other choices that Haas made, it is still true that Bruckner did not write it, nor did he ever employ Haas’s structure in any of his versions. It is to Haas’s credit that he put a vi-de over the second Kyrie citation, and over the many other passages from the 1872 version which he brought into the 1877 score, but from the present-day standpoint, it would have been closer to Bruckner’s intentions if he had prepared a pure version, one of the five (1872, 1873, 1876, 1877, 1892) that are possible. So to mix the versions gives an improper impression of Bruckner’s method of handling large forms, and misleads scholars and listeners alike. If we want to hear these features – the double crescendos, the long fantasies, and the two Kyrie citations, and for that matter the horn ending of the Adagio – we should listen to them in their proper context, which is the 1872 version. There were even further changes (and some important corrections) made in 1892 for the first publication, which was overseen by Cyrill Hynais21. Whatever Hynais’s role may have been, there is no reason to doubt that the changes and corrections were due to Bruckner himself. Discussion of these interesting matters must be deferred until the publication of the critical report to the Second Symphony, which will come out at the same time as the two new scores. Work on the new edition of the Second Symphony was begun with a firm determination on the part of the editor to avoid all subjective judgements and judgements based on the sound of the symphony as one might like to hear it. The original intention was to determine the nature of the text handed to the first copyist on September 11, 1872, and call that the original version (Ur-Fassung). But the present study has shown such a simplistic approach to be inappropriate. The copy score, and probably the parts, of the first three movements were made before the composition of the Finale had been brought to conclusion, and the early changes to them must have been made soon afterward. Accordingly, the final decision has been to present each movement in the score as it was first conceived, and then to tabulate the subsequent changes in the critical report with as clear a dating as possible. This means that conductors will have quite an array of choices available to them, and editors can only hope devoutly that they will not mix the versions and create an even greater chaos than has obtained up to now. One could perhaps avoid some of the problems by presenting a presumed first-rehearsal version as the Ur-Fassung. But, aside from the ambiguity in the nature of that text caused by Carda’s work both before and after the rehearsal, such a decision would mean the loss of the beautiful clarity of the sextuplets in the Adagio and the bold and melodically-integrated placing of the Scherzo before the Adagio. The editor is not willing to make that sacrifice, even at the risk of allowing a certain amount of subjectivity to creep into the edition. Besides, the critical report will give all of the revised material. In Dr. Nowak’s words, these variants “are all original versions.”22 Indeed they are all beautiful music and the public has a right to hear them. The quotation from George Santayana23, a remark made by him in the midst of a discussion of architecture, may also be applied in many ways to the problem of the versions of Bruckner’s symphonies. To the present editor, concerning the Second Symphony, the “one point” to which Santayana refers will always be the earliest 1872 version. In that version, the composer creates the finest balance between his vast and monumental forms, and the decoration and ornament which give the forms life and beauty. Other listeners might not agree with that choice, and the critical report to the new 1872 and 1877 editions will give them the other options which Bruckner employed. The only warning one must heed, is that straying from Bruckner’s own versions as Haas did, and proponents of “ideal” mixed versions continue to attempt, is also dangerously to stray from any possibility of finding Santayana’s point of equilibrium in Bruckner’s own thought. On Easter Sunday, March 31, 1991, three days after the sessions for the première recording were completed, David Aldeborgh and I visited Hofrat Prof. Dr. Leopold Nowak at the Rekawinkel Sanatorium, a nursing home outside of Vienna. He had suffered a serious operation the previous summer, and was in declining health. I told him about the forthcoming broadcast of the 1872 version of the Second Symphony, and discussed the status of my work in detail. As he looked over the most recent corrections to the score, and my hundreds of pages of research notes, he became very enthusiastic, expressed pleasure over what had been accomplished, and offered advice regarding some particulars concerning the final edition and critical report. He especially urged me to explain the edition so that the general listening public would understand its importance, and to defend the integrity of the versions. The conversation lasted a little over an hour, and his wife Paula was present. After friendly farewells we departed, impressed by the vigor and keenness of his mind. On May 27 he died, leaving behind a major legacy in musical scholarship. In July Mr. Aldeborgh received a letter from Frau Nowak in which she wrote: “Your visit to the Rekawinkel Sanatorium was his last opportunity to conduct a fully absorbing scholarly conversation. No one at that time could have foreseen, or recognized in him, that he would be with us only a few more days.” The indebtedness I feel toward this great man for selecting me to prepare the new edition of the Second Symphony is more than I can express. May he rest in peace. The editor acknowledges with enthusiasm the wholehearted cooperation, help, and encouragement of many gracious people. Among these are: in Austria, from the Collected Edition, Musicological Press of the International Bruckner Society, Wirkl. Hofrat Univ.-Prof. Dr. Leopold Nowak (+), director, Prof. Dr. Herbert Vogg, publisher, and Dr. Walburga Litschauer; from the Austrian National Library, Music Collection: Hofrat Dr. Günter Brosche, director, Dr. Ingeborg Pechotsch-Feichtinger, Dr. Joseph Gmeiner, Mag. Sabine Kurth; at Stift St. Florian, o. DDr. Karl Rehberger, archivist, and Dr. Friedrich Buchmayr, librarian; at Stift Kremsmünster, P. Dr. Alfons Mandorfer, choirmaster; and at the Anton Bruckner Institute Linz, Dr. Elisabeth Maier, director, and Dr. Andrea Harrandt. Also, in the United States, David Aldeborgh (Bruckner Archive, Poughkeepsie, New York), Dr. Paul Hawkshaw (Yale University), Dr. Timothy Jackson (Connecticut College), Paul Nudelman, Julia Carragan, Frederick Eaton, and Aaron Snyder. Ex. 1. First movement: alterations in dotted chords. Ex. 2. Adagio: beginning of fifth part in three versions. Ex. 3. Finale: pizzicato passage in development, 1872 version (facsimile). Ex. 4. First movement, first trumpet part at end (facsimile). Fascinating and deeply informative. I found that restoring the Scherzo-Adagio order has a striking dramatic effect that seems more authentic and more in harmony with the ‘story’ the symphony unfolds.